Looking for a portable, comfortable, safe, sturdy, lightweight, and reasonably priced pack 'n play? You've come to the right place! We tested 19 different playards and travel cribs - in the stores, in friends' houses, and 6 different models in our own house. We considered 5 primary things in our tests: weight and portability, ease of use, durability, comfort, and safety. Our hands-on reviews resulted in about a dozen of the best playards for the year, with some truly excellent newcomers. Here is our comparison chart of the top 5 best travel cribs on the market, followed by our in-depth reviews and ratings. Traveling has never been easier for parents - no longer do you need to rely on the hotel, or the in-laws, to have a clean and safe crib for your baby. With a playard (usually called a "Pack and Play" or "travel crib"), you simply unzip it from its carrying case, unfold it, and put on a sheet. Your baby or toddler is then ready to sleep, play, or relax in a portable crib that is both convenient and safe. It's also great when you need to shower, get ready, get dressed, or do some cleaning - a safe place where your baby can't get in trouble while you're not in within direct view. Super convenient for home or travel. If you're looking for a regular crib for the nursery, check our reviews of the best cribs of the year, and best bassinets. In our hands-on reviews we considered its size and weight (can it fit in a backpack? can it be a carry-on? how heavy is it? ), ease of use (what is the set-up time? what is the break-down time? how hard is it to stuff into its carrying case? can it be easily cleaned? ), durability (can your toddler jump in it? will they tip it over? will it fall apart from repeated use? ), Comfort (is the mattress too thin? is the fabric soft? does the mattress lay flat? ), and Safety (does it go beyond government safety standards? is the fabric chemical free? are there pinch or injury points?). Here are the Best Travel Cribs of 2019! 1. The Lotus Travel Crib and Portable Playard. This is the best-reviewed playard pack and play of 2019 for good reason, but it is also sometimes hard to find. Due to demand, the Guava Family Lotus tends to get sold out quickly, even at Amazon! It's a fantastic, ultra-portable, lightweight (13 pounds! ), and stylish playard that fits in a backpack, can be brought on a plane as a carry-on (folded, it measures about 23" x 11" x 8"), and parents absolutely love it. It assembles and disassembles in about a minute each, is nicely padded and comfortable, is GreenGuard Certified to be free of harmful chemicals (PVC, BPA, Lead), and has a zippered side-door for fun (think play fort!) and easy access to put down a sleeping baby. It has a unique style and shape, durable construction, and is super easy to use. It tends to sell for around $250 but we've seen it as low as $200. Pricier than a basic Graco, but worth every penny for anyone planning on using it for travel, whether on the plane or walking to the park for a picnic. Long and narrow in shape, at 42" x 24", which translates to only about 7 square feet of play space. More of a playard for sleeping than for playing, per se, given the smaller area. There are only two small negatives that we found: first, the mattress is a little thinner than what you might find in the Pack N Play or BabyBjorn versions. It's still soft *enough* but not really plush. Second, the Velcro tabs that you need to fasten during assembly can be time consuming. After a few times, you'll get a hang of it and be setting it up within 30 seconds (really). Highly recommended! Interested? Check out the Lotus Travel Crib here! 2. Graco TotBloc Travel Crib. Note that our #3 is a bit better overall option than this, but also over twice the price. Numbers 2, 4, and 5 on our list are very similar in style and utility. They are all square rather than rectangle, simple in their styling and functionality, but all sturdy, comfy, and useful. This first one of the three has a really cute style and works very well. It is 38" x 38" in size (about 10 square feet of play area), folds and unfolds very easily, his highly breathable/ventilated on the sides, and has very cute lady bug and other cartoony pictures on the sides. When we took it out of the package, we were able to get it setup for the first time in under 3 minutes. It was really fast and simple, and there were no tools required. You unfold it and push down in the middle of the mattress area, and it pops into shape. We also thought that the mattress was relatively thick and supportive, which is rare in a playard. Thicker than the Delta version (below). Overall, we thought it was decently sturdy, and it seemed well made. It is quite heavy (about 24 lbs. ), so not great for air travel, but also quite a bit more spacious than typical rectangular playard options like the Lotus and traditional Graco. The Lotus wins, hands down, but this is a great second option that fulfills a slightly different need. It's quite a bit cheaper (usually under $100) and very much more basic. Note that we were able to get our hands on the cute colorful design, with the sun, butterfly, and ladybug decorations, but this model has become very difficult to find. There are other less colorful options available for around the same price. For a baby up to 35" tall. Interested? Check out the Graco TotBloc Travel Crib here. 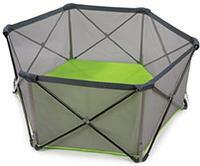 This excellent playard is very similar to the Lotus option, but with a couple of weaknesses. Let's start with the strengths. The BabyBjorn Travel Crib Light is stylish, ultra-compact (but doesn't fit in a carry-on-sized backpack like the Lotus), assembles and disassembles in about 30 seconds, has a very thick and comfortable mattress, and is durable and easy to use without those pesky Velcro straps that the Lotus has. Sounds pretty good, huh? Well it is, it's really an excellent playard, with only a few things that make it #3 on our list. First, there is no zippered side door for fun and easy access to put down a sleeping baby (like the Lotus). Second, it fits in a bag but it's not as convenient as a backpack and is too big for a carry-on; and since it's too big to be a carry-on, you'll need to take up quite a big space in your suitcase to pack it in - otherwise you'll be paying for an extra bag check (and moms report it's not really tough enough to put up with the abuse of being a checked bag). So, this is an excellent playard but is probably best for traveling by car or if you're willing to take up most of the space in your suitcase. Third, it is quite a bit smaller than the other playards on this list, with a mattress size of only 41" x 23.5", which translates to about 6.5 square feet of area. Not quite big enough for playing, but great size for secure sleeping. Finally, we found it difficult to put a sleeping baby down into the playard given the narrow opening and since the mattress sits on the floor. That makes for a nice firm sleeping surface, but is a pretty far reach down while trying to gently place a baby down. The Lotus (#1, above) solves this problem by adding a zippered side. Interested? Check out the BabyBjorn Travel Crib Light here. 4. 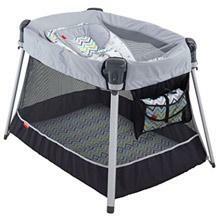 Fisher-Price Ultra-Lite Travel Crib. This is a cool new concept introduced by Fisher-Price. It combines a top "inclined sleeper" seat with a playard. The sleeper idea is great for smaller babies who have not yet learned to roll over or pull up on the sides. For those little ones, it gives them a nice high perspective for seeing what's going on and interacting with family. Much better than being down on the bottom while awake and wondering what to do with yourself! So, we liked that new concept, and also found that it's actually great as a cozy inclined sleeper, and also great for changing diapers. Beyond that, we also liked the overall functionality of this playard. Assembling and folding the playard followed a unique procedure we hadn't seen before, but once we did it a couple times we had it down to an art. It folds up to a square about 26" x 23" and about 9" thick, and slides into a provided bag with a shoulder strap. The bottom portion is nicely padded on the mattress and upper rails, and the vertical rails were nicely isolated from the insides to prevent bonking against them. The mattress had reasonable padding and sits on the floor, nothing to write home about, though it was quite a bit smaller than most other options on this list coming in at about 37" x 26" (about 6.5 square feet of playing space, which isn't much). Fisher-Price calls this playard the "Ultra-Lite" for good reason, coming in at only about 15 pounds. Given its compact size when folded, and the relatively lightweight (surpassed only by the Lotus), this portable crib is a great option for travel by car or air. And it includes a cute little travel changing pad and diaper clutch, which fit conveniently into a mesh side pocket. Speaking of mesh, we liked the all mesh sides to help air circulation. Overall, a great but small playard, suitable for air and car travel. What we initially assumed was a bit of a gimmick with the top inclined sleeper, actually turned out to be pretty useful! Interested? Check out the Fisher Price Ultralight Travel Crib here! 5. Joovy Room2 Portable Travel Crib. Note that it comes in much better colors than just black! This is similar in style and function to the Graco unit above. It is about an inch larger in width, coming in at 39" x 39" (about 10.5 square feet of play area) which turns out to be more than enough room for the little guy to nap and play. This unit, however, is really about style. It has a modern and sleek design that fits into urban and contemporary decors. It has clean lines, subdued colors, and doesn't have any (maybe tacky?) cartoony baby colors and pictures. In our testing, we didn't think the mattress was quite as plush as the Graco TotBloc, but it did feel very sturdy, well made, and safe. Just like the TotBloc it has breathable/ventilated mesh sides. While it is very sturdy and looks great, we also thought it was a bit heavy for our tastes. A few moms commented that it was just too heavy to, for instance, carry to the beach. We pulled out our scale and it tipped the scale at just under 30 lbs. That's pretty heavy, but we also point out that it pays off in the sturdiness department. The major downfall with this unit is that it was honestly rather difficult to set up, and required a bit more brute force than we thought it should in order to fold open. After a few times, we got the hang of it, but it was frustrating that it required the brute force of 2 people to get it properly opened. So that's not so great, and puts it behind the Graco option. Outside of that, it's an excellent playard option and you'll likely get used to the opening/folding mechanism after a few uses. This thing is big, but the price is not. Interested? 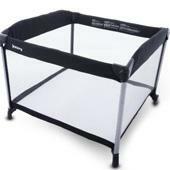 Check out the Joovy Room2 Travel Crib here. 6. Delta Novel Ideas Travel Crib. Just like the Graco and Joovy options above, this is another square playard. The square units are quickly gaining in popularity, giving parents and babies more flexibility to spread out and nap without having to face one direction or another. It's more like the old-fashioned playpen rather than the traditional playard shape. This particular Delta Novel Ideas unit is a bit smaller than the other two, however, coming in at 36" x 36" (9 square feet of play area), which may seem large but when it's next to the Joovy Room2 it looks quite small. It is between the Graco and Joovy in terms of weight, however, coming in a bit heavy at 28 pounds. When we took it out of the box we were pleasantly surprised that it was not only fully assembled, but it was very easy to pop completely open and have it ready to use within a minute or two. The mattress was decent, if not a bit thin. Overall, our testing moms thought this was one of the best options for those on a limited budget. They thought it really gets the job done. Not quite as sturdy as the Joovy (or even the Graco), and not quite as spacious, but it's also only about $75. You can't go wrong with this playard. Since it is relatively new to the market, however, we're holding off on putting it higher on our list until we see some good reliability out of it. We'll update in a few months with some more info. Interested? Check out the Delta Novel Ideas Travel Crib here. 7. 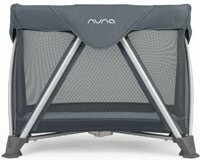 Nuna SENA Aire Travel Crib. This is an awesome, stylish, lightweight, portable crib that has a unique look and feel. Like all Nuna products, such as their awesome car seats, it is very high quality, well designed, and uses soft-touch fabrics. This travel crib has an awesome feature where the mattress can be placed at a higher position to make it a bassinet - providing a sleeping surface that is much higher up than the bottom of the actual travel crib. That means it's great for use with infants and toddlers alike, transitioning from an infant bassinet to a toddler travel crib within minutes. What's really cool is that the entire unit folds up with the bassinet system in it. Unlike other portable cribs with bassinets that require you to remove the bassinet attachment and pack it separately, this system combines it all into a single folding mechanism that fits easily right into the included carry bag, making it easy to have only one addition to your family travel bags. When we tried this portable crib out, we found it easy to assemble and use. It has a removable changing station you drop right onto the top when needed, true one-handed folding, and a truly excellent quilted mattress that is among the most comfortable portable crib mattresses used. We also thought it was super sturdy, with its 8 grippy feet on the bottom, and its cross-rails. So overall, we really liked this Nuna SENA Aire travel crib, and it gave us peace of mind for safe sleeping during family travel to grandma's house and beyond. But we also want to point out some things. First, it's really expensive and only available at premium retailers like Nordstrom, coming in at around $300. Second, it's a bit heavier than some other options, coming in at 25 pounds, so keep that in mind if you'll be traveling alone and trying to carry this, your bags, and wrangle your baby at the same time. It's still nowhere near as heavy as a Graco Pack N Play, but worth mentioning. Third, it's only rated up to about 3 years of age, at which time they'll be able to climb out and probably get too heavy for the mattress and bottom supports. Finally, the cross-bar design is stylish and super functional, but we found that our 2-year-old could push his foot against the mesh side and used the cross-rails to step on and boost himself out of the travel crib. Keep that in mind if you have a monkey like us! So overall, it's an excellent portable crib, but just like the 4Moms system it's a bit too expensive for our tastes. Interested? You can check out the Nuna SENA Aire here. 8. 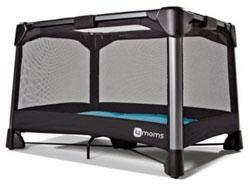 4Moms Breeze Plus Travel Crib. This is an awesome newcomer, and it holds a lot of potential. This is good sized and a bit heavy, coming in at 46" by 33" by 29" high, and just under 25 pounds. That's not as heavy as the beast Graco unit (below), but it's enough to make a sore arm if you need to carry it through an airport. The size makes it a comparable square footage to the Joovy Room2, both coming in just over 10 square feet of room for sleep and play. The 4Moms is slightly rectangular, and the Joovy is square. They call this the Breeze for good reason - it is extremely easy to pop open and close up when you're done using it, especially on a hardwood or tile floor. Not as easy on carpet since the legs can't slide out into position easily on a thick carpet (too much friction). It has a convenient bassinet feature that attaches and hangs from the top sides. This is great for infants to keep them at a higher level (like at bed level), but you'll only get a few months out of this feature since its max weight is 18lbs (it can also be used as a changing table later on). The bassinet is convenient but unfortunately not very soft or comfortable. Of course, infant sleeping surfaces are supposed to be quite firm, so this is expected. The primary mattress lower down is actually quite good, not too firm or soft. We really liked this playard for these reasons. We also liked that it is well built and sturdy, has a nice simple style, and is very spacious. What we didn't like is that it's quite heavy and awkward to carry along, the bassinet attachment doesn't fit into the carrying case, and its price is a bit outrageous coming in at around $300! Not to mention that the 4Moms fitted sheets for this playard are an additional $40 or so. That's too much for us, especially when you can get other great options for substantially less money. So, it has good features and high quality that put it high on the list, but a price that drops it down several notches. Interested? Check out the 4Moms Breeze Travel Crib here. 9. Summer Infant Pop 'n Play Travel Crib. 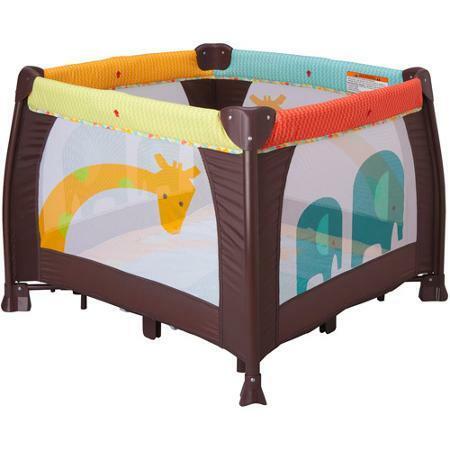 This is a great, large, inexpensive, no-frills playard that is perfect for at home, on the beach, and in the yard use. We found it very sturdy, easy to pop open and fold closed, and quite large. It comes in at 48" wide and about 26" tall. At 14 square feet of play area this is the largest playard on our list. Less for sleeping, more for playing, unlike the Lotus and BabyBjorn options. We found it perfect for car travel to the beach or park, great for an indoor ball pit or out in the yard, but less suitable for travel by plane. Even completely folded up in the included carrying case, it's just way too big for that type of travel. The mattress is fine, but not really comfortable for sleeping. So overall, you're getting a very large, sturdy, and well-constructed playard that is great for some particular uses. So why so far down on our list? Well, the architecture of the playard is a bit unfortunate with the cross-bars all around the sides. The mesh netting is a bit loose, so a few things happened during our testing. First, one 20-month baby quickly climbed right out by pushing his foot to stretch the netting and climbing on the cross bars. Second, when we used it as a ball pit, one toddler bonked his head on the cross bars. There are some ways to solve this, for instance by placing foam pipe insulation (or even pool noodles!) on the bars, but that seems like a bit of work that should have been done by the company in the first place. In any event, we definitely think this is a great playard, but you will need to do something about to pad the cross bars. Of course, this doesn't solve the climbing issue. Interested? 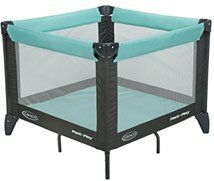 Check out the Summer Infant Pop and Play Travel Crib here. 10. Kidco Travelpod Portable Travel Crib. This Kidco travel crib is most similar to the BabyBjorn Travel Crib Light, with similar styling and functionality. Coming in at just about $130, it's a pretty good deal given its features. This baby travel bed and toddler bed is super easy to set up and fold down, and get into its included carrying case. It folds into a flat rectangle, about the size of a very large briefcase. It uses highly breathable side mesh, removable fabric for machine washing, a decent mattress that's a little flimsy for our tastes, and supports from baby up to about 3 years of age. What's really amazing about this travel crib is that it's super lightweight, coming in at only about 10 pounds! That's really impressive and makes it an awesome candidate for popping right into a large suitcase without going over the airline's weight limits. But given that it's so lightweight, it's also a bit sparse on the padding and comfort, which is its primary limitation. It also makes it less sturdy than some of the others, and we found that our 1-year old test toddler was able to tip it a bit to the side when he was pushing against the mesh. But it's so inexpensive, lightweight, and easy to assemble, it's almost forgivable that it's so spartan. Worth checking out, but probably not worth a higher spot on our list. Interested? 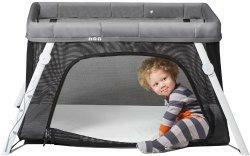 Check out the Kidco Travelpod Portable Crib here. 11. Phil and Teds Traveller Portable Crib. 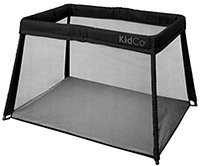 This portable crib is very similar to the Kidco Travelpod (above) in its design, features, and functionality. But it's the lightest travel crib on our list, coming in at only 6 pounds, which is less than the weight of a single brick! When it's all folded up in the small carry bag, it feels super lightweight and easy to transport. So this is really the perfect travel crib for air travel or travel in smaller vehicles. The biggest benefit of the Phil and Teds Traveller, in addition to its extreme portability, is that it has a zip-open front like the Lotus Travel Crib, which makes it amazing for play, but also makes it easier to pull a little baby in and out (since the mattress height doesn't adjust). But it's so lightweight that it's also not super sturdy or stable, and we worry a bit about it tipping over very easily. Phil and Ted tried to fix that by putting really long feet on it, but our 1 year old test toddler pushed so hard on the side that the entire thing looked like it was going to topple over. So that's concerning. We actually ended up taking this portable crib on a road trip and set it up in a hotel. We wedged it between the bed and the wall and it was perfect in there. Our toddler could play in there with the open front and when it was time for bed, we felt safe that he couldn't topple it over while we weren't looking. Other than the stability issue, if you're looking for a super lightweight but otherwise pretty sparse (the mattress wasn't very comfy, and the entire travel crib felt a little flimsy) portable crib, this might be an option for you. That is, if you're willing to spend about $40 more than the Kidco Travelpod just to have the zip-open side. Interested? Check out the Phil and Teds Travel Crib here. 12. Graco Pack N Play Travel Crib. The Graco Pack N Play is like the Cadillac of playards - you can get a basic model for a mid-range price, or you can load it up and get it into a much higher range with all sorts of options: attachable changing tables, baby rockers, music players, vibrations, etc. With all those options you will end up paying around $150-200. You'll have a great playard, but you'll also have a very heavy (37 pounds!) and cumbersome portable crib with lots of peripheral parts to lose, break, and replace batteries in. Graco has ruled the playard market for over a decade now, so much so that their trademarked name "Pack N Play" has become a more common term than playard, making it one of the most popular travel bed options on the market. It was one of the first portable cribs to make the idea of travelling babies more tolerable for parents, providing a safe and clean option for infants and toddlers, rather than using the old and often dingy and dirty hotel crib or bassinet. But it's also a little bit outdated in comparison to the portable cribs higher up on this list. It's big, heavy, cumbersome, and not great for anything other than car travel, making it one of the less ideal travel cribs for babies. But it's sturdy, well built, and has basically any feature you can imagine having in a playard - except for an ultra-portable carrying case or zippered side. Note that Graco makes a lighter-weight version of this, the Graco Travel Lite Crib, which brings the weight down to under 20 pounds (though that's still pretty heavy overall). Prices range from about $100 to $200 depending on the number of features you need. Interested? 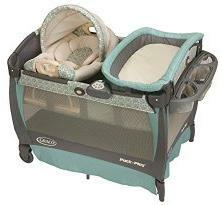 Check out the Graco Pack and Play Travel Crib here. 13. Kidco Peapod Plus Infant Travel Crib. This is a super unique portable crib that looks like a miniature tent for your baby or toddler, complete with the zip-up mesh sides and fly covers. It's a truly awesome idea for more adventurous kids who would value the experience of sleeping in something that looks and feels like a real camping. There are a lot of types of travel cribs, most of which are crib based, but this one really takes the cake for its unique form and function. We're not really sure whether to call it a travel crib, but it's definitely the lightest travel bed that we've seen, coming in at less than 4 pounds and folding down into a super small circular pouch. We actually bought it and used it only as a baby beach tent, which it does a great job of given its UV protection and anchor straps that you can use to secure it down into the sand (with stakes, which it doesn't include). We never used it as a travel crib because we're not quite that adventurous, but we do see how valuable it could be to have something so small and light to take with you when travelling. Kudos to Peapod for figuring out that new marketing angle for this! Overall, it's cute, durable, functional, and super fun for babies and toddlers who might like this sort of thing. Or you can just use it as a baby tent for the beach or pool; for about $90, it might be worth the versatility and ease for portably baby travel. Interested? Check out the Peapod Plus Travel Bed here.